Ahhhh... This is more like it! The crowds have gone, the traffic has returned to its normal mess, students are back in school, foreign tourists are enjoying peaceful mornings sipping coffee at their favorite places and watching the Zihuatanejo world go by, and charter boats are lined up at the pier awaiting clients to take sportfishing and whale watching. 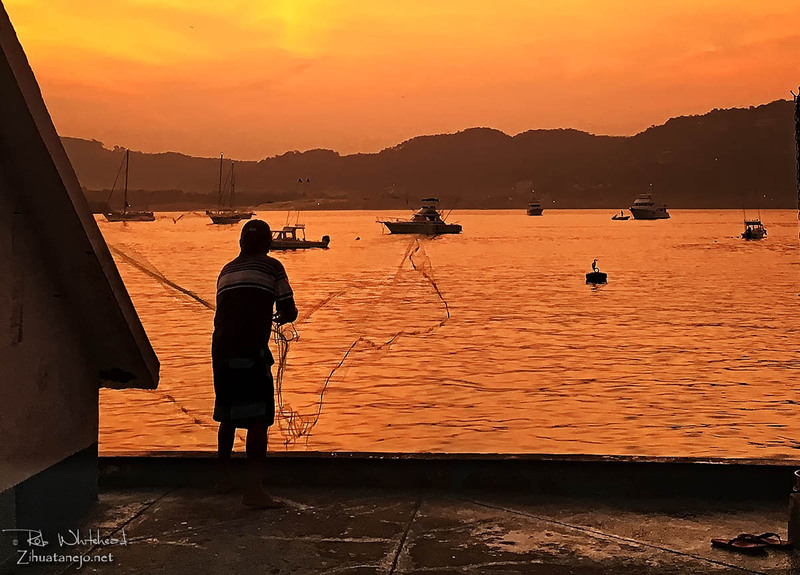 A great tranquility has returned to Zihuatanejo. Just in time! Some of us were starting to get a little squirrely. A light fog this morning made for a red sunrise, though no cause for sailors to be alarmed. Lupita asked me to remind folks that she needs reading glasses often called "cheaters" with their gradations or strengths marked on them. Unmarked prescription glasses are near impossible for her to find anyone who can use them. So who bought a rosca de reyes yesterday and who got the baby Jesús? This guy didn't appear to be having much luck with his net from the pier.